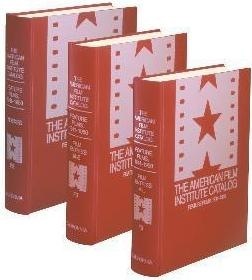 * AMERICAN FILM INSTITUTE CATALOGs: Film Beginnings 1893-1910 two volumes in library buckram binding is $195 (or $150 trade bound). 1911-1920 two volumes is $245. 1921-1930 two volumes (library binding) is $330. 1931-1940 three volumes is $225 with library binding (or $145 trade bound). 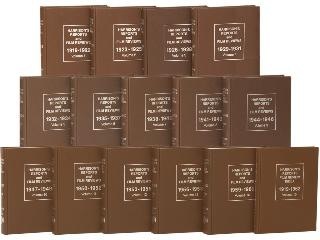 1941-1950 three volumes (library binding) is $375. 1961-1970 two volumes (library binding) is $350. * FILM SUPERLIST 1894-1959. 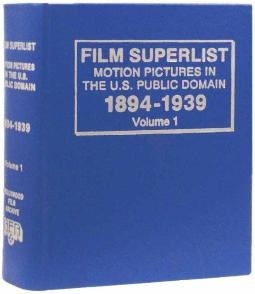 1894-1939 (Volume 1) with 57,000 films is $595. 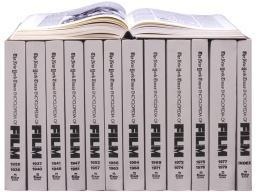 1940-1949 (Volume 2) with 19,000 films is $495. 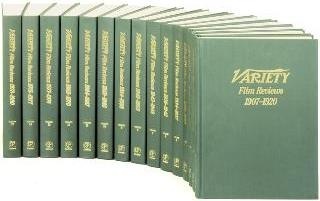 1950-1959 (Volume 3) with 27,000 films and TV programs is $195. Each book has Library of Congress Search Reports. Books are library sewn in library buckram. * VARIETY FILM REVIEWS 1907-1996. The complete reprint of every Variety film review (about 50,000) in 24 volumes with Index, casts, role names, credits, literary sources, plot and story information. Volume 6 (1938-1942) is only $75.00 as an introductory offer. * VARIETY OBITUARIES 1905-1994. In 15 volumes, with Names Index, a complete reprint of the death notices of over 100,000 people. Individual volumes can be purchased. * VARIETY TELEVISION REVIEWS 1923-1988. Nowhere else in the world can you buy a new set of the reprints of Variety Television Reviews, published in 1990. 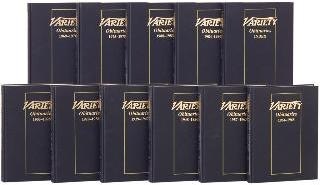 The 15-volume set contains the reprints of all TV reviews of weekly Variety from 1923 through 1988, as well as the Daily Variety reviews from 1946 through 1960. $3,295. There were bi-annual supplement volumes for 1989-1990, 1991-1992 and 1993-1994. There have been no updates since then, and none are planned. Prices vary with availability. * NEW YORK TIMES FILM REVIEWS 1913-2000. About 25,000 films in 22 volumes with Index, including cross-reference of acting and production credits. * SCREEN WORLD 1949-1996. Each annual contains casts and credits of virtually all the year's theatrical releases, with credit index and obits. * HARRISON'S REPORTS AND FILM REVIEWS 1919-1962. 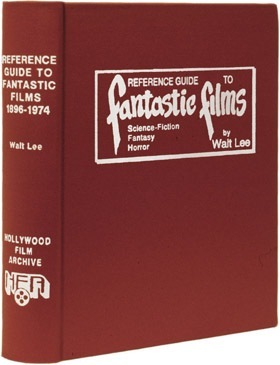 Fifteen-volume set (with Title Index) contains complete reviews (about 17,000 movies) and editorials. Most individual volumes are $160; the complete series is $1,985. 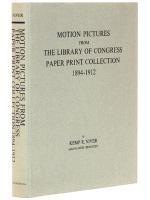 * MOTION PICTURES FROM THE LIBRARY OF CONGRESS PAPER PRINT COLLECTION 1894-1912, by Kemp Niver. About 3,000 restored early films with detailed description of content. List price $200. Discount price $149. 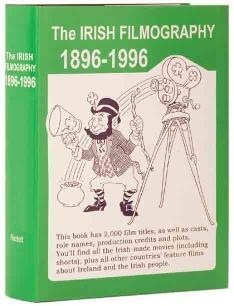 * THE IRISH FILMOGRAPHY 1896-1996. Complete casts, credits, plots, etc. of movies (worldwide) about Ireland and Irish people. Discount price $95. 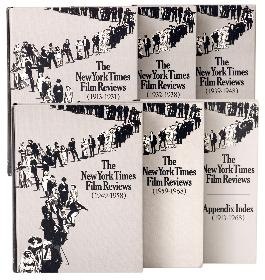 * NEW YORK TIMES ENCYCLOPEDIA OF FILM 1896-1979. In 12 volumes plus index, this is the reprint of all their articles about film, EXCEPT reviews and obituaries. $2,495. These are probably the only new sets in the world.